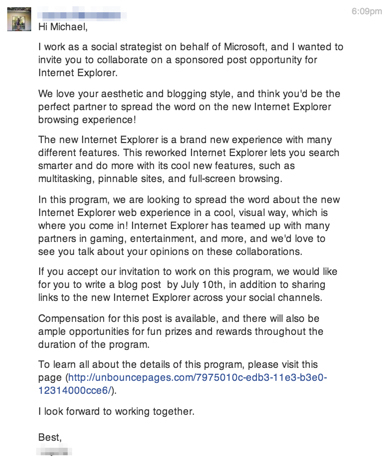 Basically, they want to pay him to write about Internet Explorer. He’s a good writer, sure, but he’s not the kind of guy you want in your blind mailing list. Again, if you wonder how a lot of the web works, look no further than this exchange. There are few good guys out there – which is why I pride myself on not doing paid posts anywhere and why I try my damnedest to be nice to companies and indifferent to PR people and why TechCrunch never accepts payment of any kind – but there are a lot of people who are in this blogging thing for the money. That’s fine for them, honestly, and I can’t fault them. Marketing is hard and I don’t envy the small guys trying to get the word out about their product. But Microsoft needs a coordinated blog burst like it needs a hole in the head. Think about it: hundreds of mercenary writers who are looking for a quick buck and who will write stuff like “IE is my favorite briwser!” all over the web. It’s not quality content and it’s not a social buzz. It’s just a mess.